Fans of the Winnipeg Blue Bombers of the Canadian Football League will soon enjoy their home games from the comfort of Hussey's Fusion stadium chair. We were recently awarded the contract for 33,500 seats at the new Blue Bombers Football Stadium on the University of Manitoba campus in Winnipeg. Logo for the Winnipeg Blue Bombers of the Canadian Football LeagueA joint venture between the City of Winnipeg, the Blue Bombers Football Team and the University of Manitoba, the new Stadium is slated to open in mid-2012.It will be used for soccer, football and lacrosse as well as hosting major concerts. This is the first major stadium installation of our Fusion sports & entertainment chair. A winning combination of the best in stadium seating, the Fusion teams the strengths of our popular Olympiad and Medallion seats into a state-of-the-art stadium seat that's greater than the sum of its parts. 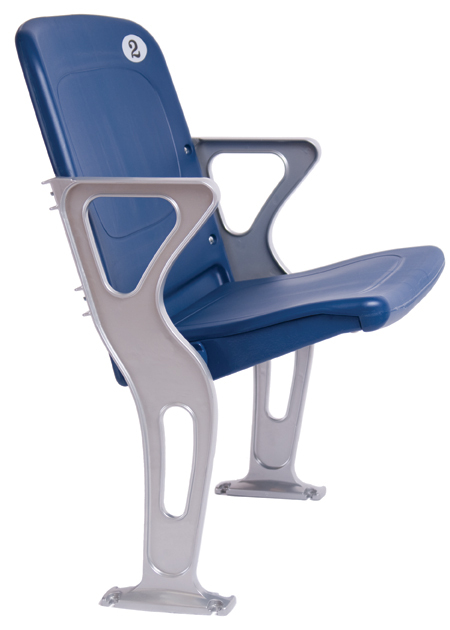 Fusion is contoured for ergonomic support to improve the spectator experience. And with contemporary lines and a smooth, polished surface, the seat looks as good as it feels. Along with our local dealer, Wearing Williams, we're eager to contribute our part to this beautiful new facility for the citizens of Winnipeg and Manitoba. We're not sure about the Blue Bombers' prospects for 2012, but you be sure these Hussey Seating Fusion seats will never let you down.